What are the Costs of Modular Building Innovation? Modular home building was a brand new idea a decade ago and not everyone has accepted this form of building as normal. Being innovative and appealing can be difficult when it seems like there’s only so much to do with a modular home. 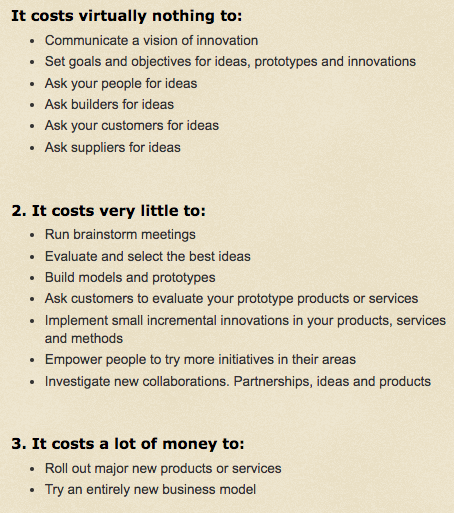 According to modularhomecoach.com, the cost of innovation can be inexpensive if done correctly. On the flip side, it can also be costly if done incorrectly and rashly. For many, there’s a worry of bringing new ideas to the table because they might be ridiculed or rejected. However, talking about as many ideas as possible in a group setting is the most effective way to build off of one another and to inspire more creativity. Innovation comes in small steps and needs to be supported by the group. If ideas aren’t accepted, explain why in a respectful way. For some companies, the hardest part is to find the person who will volunteer and lead a discussion. If you have ideas, grab a co-worker and present them together if it makes you feel more comfortable. Trying to focus on categories 1 and 2 will help to be cost-efficient and innovative at the same time. Here at Irontown Homes, we’re always trying our best to be innovative and bring you all the best there is.